Those are the words of a non-Muslim public/political figure who attended the Community Iftaar organised by https://camharmony.org/ on Saturday, 19th May at Cambourne Hub (Cambridge). This experience by Cllr Mark Howell is amazing because he has been in public life for around 2 decades and did not get chance to mix up with the Muslims in their social and religious gatherings. He also mentioned that it was his first time to see Muslims praying in Congregation and he was impressed to see the beauty of equality and discipline. He asked many questions about Islam and Muslims which were received and answered delightfully. The Cambourne Church Minister Karla Parker was pleasantly surprised to see the vibrant Muslim community in a purely religious gathering. She was amazed with numbers of people at a single place, colours of dresses and range of International Food which was mainly prepared by the fasting families putting lot of enthusiasm in to it which made it even tastier and very special for everyone. Each and every member of Community was an organiser, host and guest and the event was a great example of community spirit. As Iftaar is open for anyone including travellers and strangers therefore invitation for participation was kept open up to last moment. For this very reason, there was a huge number of participants including many from diverse communities. Kids also felt part of the ambience in the form of their beautiful Ramadaan posters were displayed on the wall. The community spirit was further enriched by a spiritual talk by renowned Islamic Scholar and diversity champion Prof. Tim Winter aka Shyikh Abdul Hakeem Murad followed by the special Ramadaan supplication which was received with huge warmth. 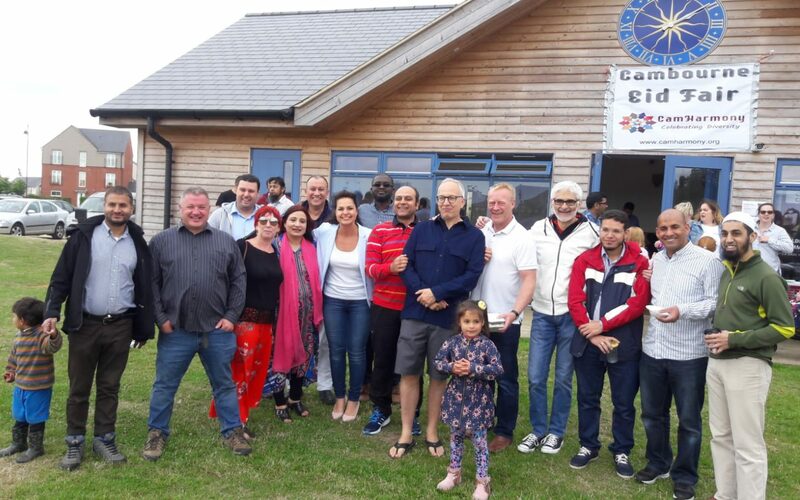 Cam Harmony Team feel immensely humble in expressing gratitude to the people who came to this event to make it a ground breaking diversity gathering in Cambourne, the very first of it’s kind. Also great thanks to the people who were there to extend their support of any kind to make it a remarkably successful event. Special thanks to Cambourne Parish Council for supporting this event which was organised in conjunction with Cambourne1 (www.Cambourne1.org.uk) and sponsored by CamSpice.co.uk.